Give your business cards a different look and stand out from the crowd with oval business cards. 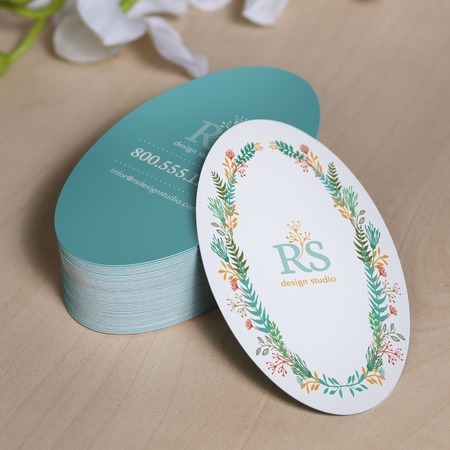 With the uncommon shape making them more eye-catching, these oval-shaped business cards will convey a strong message to your customers. These cards are popular for design studios, fashion-related businesses, artists, and beauty salons. Here at UPrinting, business cards are printed on thick and premium quality 14 pt. cardstocks that come in three finishes: matte, gloss, or high gloss. You may order quantities ranging from 25 – 10,000 pieces. Our standard printing turnaround times for business cards are 2, 4, and 6 business days.